The year 1968 marked many changes for the United States. It signaled the end of the Kennedy-Johnson presidencies, the pinnacle of the civil rights movement, the beginning of Women's rights and Gay rights, and the beginning of the end of the war in Vietnam. More than that, it meant a change in public attitudes and beliefs. Photojournalism had a dominating role in the shaping of public attitudes at the time. Now, the exhibition comes amid a time of heightened awareness from political, racial, and social tensions. The year started with the Viet Cong opening the Tet Offensive by attacking major cities of South Vietnam, a move that triggered President Lyndon B. Johnson's call for peace negotiations. Johnny Cash recorded "Live at Folsom Prison", Eddie Adams photographs a Viet Cong officer as he is executed by Nguyen Ngoc Loan, a South Vietnamese National Police Chief. This photograph made headlines around the world, eventually winning the 1969 Pulitzer Prize, and sways U.S. public opinion against the war. On March 16, the Mai Lai massacre further shocks the nation, and on March 31st, President Lyndon B. Johnson surprised the nation by choosing not to run for reelection. On April 4th, civil rights leader Martin Luther King, Jr. was shot and killed in Memphis, Tennessee, leading to riots in Washington, D.C. and other cities. In late April, student protesters at Columbia University in New York City take over administration buildings and shut down the university, only one of many college protests that would unfold across the county. In June, Robert F. Kennedy, former U.S. attorney general and U.S. senator from New York, was assassinated in Los Angeles while campaigning for the Democratic Presidential nomination, and Bill Eppridge records a lone busboy trying to comfort Kennedy as he lays sprawled on the kitchen floor of the Ambassador Hotel. 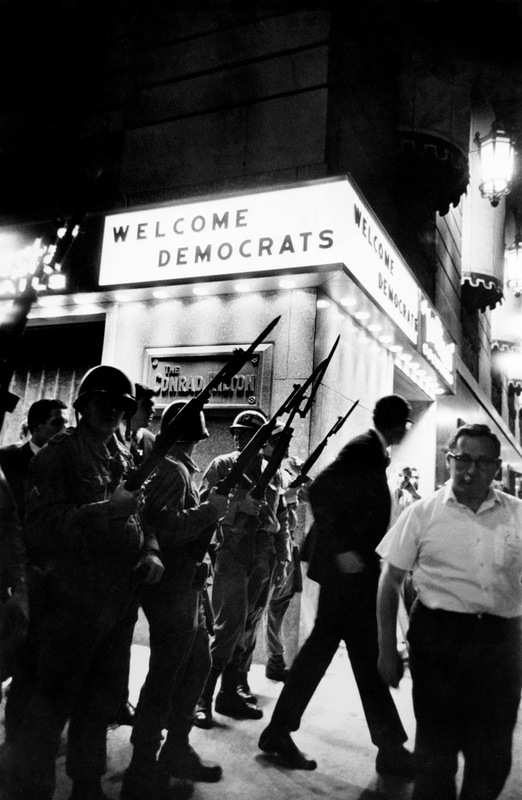 In August, the Democratic National Convention in Chicago was marred by clashes between Vietnam War protesters and Mayor Daley's police force. At Mexico City's Summer Olympic Games, African American sprinters Tommie Smith and John Carlos won gold and bronze medals, then bowed their heads and raised clenched fists during the playing of the U.S. national anthem in protest of U.S. racism. And in November, as the Beatles' "White Album" is released Richard Nixon was elected President with running mate Spiro Agnew, making one of the most extraordinary political comebacks in U.S. history. Finally, in December, Elvis Presley's "1968 Comeback Special" airs on NBC television and Apollo 8 enters orbit around the moon. In culture, Barbarella, Funny Girl, 2001: A Space Odyssey, Planet of the Apes, Rosemary's Baby, and Yellow Submarine dominate the box office; the Fillmore East opens in New York, Hair opens on Broadway, and "Hey Jude" by the Beatles and "Jumpin' Jack Flash by The Rolling Stones top the music charts.